A show almost as unpoular as you are! Anti-social's, outcasts, and unpopular folks alike rejoice! Our main protagonist Tomoko is here to save the day...... Alright, so no she really isn't. She's your pretty typical otaku type who struggles to navigate through high school being the social outcast. Let me tell you, some of the stuff that this poor girl endures....Is just cringe worthy. You'll spend a lot of your time either laughing or having flashbacks of your own similar experiences. So.....is it a good show? Well, that depends on what you are looking for. The animation isn't anything special in my mind. The audio is pretty good quality. The opening theme has quickly become one of my favorites(I have a thing for good metal songs). The story is a good mixture of humor with just the right amount of serious sprinkled in with it. The scenario's the story presents are actually pretty believable and she handles them as well as she can. I rated it five out of five because of my own social misfit status. I can relate to her way too much. If your looking for something that doesn't follow the usual tropes then give it a try. Not to mention some of the references scattered through the series are pretty good. TLDR: Social misfit trying to make it through highschool. Cringe worthy/humorous and pretty good. The best. Just the best. I know. Sounds Hyperbolic. Why would you call this Moe Sh**show the best anime ever? Allow me to explain my point of view. It's not the best written anime. It's not the most entertaining anime. It's not even the best looking anime. It is however, the anime I needed the most. I should have started this review by mentioning that I am a very socially awkward person. I have little to no friends, I have very limited hobbies, I spend most of my free time in front of my computer, I feel extremely stressed at social gatherings, I often have suicidal thoughts, I hate looking at myself in the mirror, I fear my future because I don't expect myself to improve in the slightest at any angle and I never even kissed a girl. This anime showed me what I can become if I don't try to change. This is the definitive warning for all miserable introverts like me. At the same time being a gut wrenching combination of Kafka comedy and drama. I could talk for hours about the deep and intricate plots of Watamote, but I'm still waiting for an opportunity to revew the manga, as it helps to add full context. It's not for everyone, but It's for me. Great show, but could be hard to watch..
Great show, with a very lovable protagonist. She's troubled, and sometimes doesn't help her own case, but you root for her anyway. She does some pretty cringey things (I had to pause momentarily to catch my breath) but I want her to win eventually. I kept wanting to cry out to her family and classmates to just help her out! But in the end, it seems like she is becoming better off, albeit slowly. Hard to watch for some. I felt strongly like I was seeing myself, and all I wanted to do was help her. I do selfishly wish she had more obvious changes cause it makes me sad that she may have to struggle for longer. Cheering her on all the way!! You want her to do well and hope she wins in the end. That being said, there will be some funny moments from this but also some soul crushing moments too. If you have people like this in your life, please help them!! Let them feel like they belong somewhere and with someone. Being someone who was a loner in highschool himself, I can say that it would make a big difference in their lives. On a final Note: The Nichijou Kirari song was absolutely gorgeous and drove me to tears. This was the first I ever watched and I'm glad because it gave me a good impression. I would actually suggest the manga more though because it has pretty much all the stuff in the anime and more, plus I think it's more interesting and flows better and all that. The ending of the anime seems kind of abrupt to me, probably because it was a bit of a forced ending since the manga doesn't stop there at all. This anime makes me want to take a shower. accept for the cheating at yu gi oh part...thats tasteless. She's Not Supposed To Be All The Way Relatable; She's A Cautionary Tale! I see so many people say that they relate 100% to Tomoko. Or on the flipside, I have friends that can't stand this show for glorifying this character. Tomoko isn't supposed to represent the ever day otaku; she's a cautionary tale that slowly moves her way out of being unbearable. I, personally, like this show because there are things I can relate to from my dark, cringy middle school/early highschool years. This show is heavy on the second hand embarrassment, of course. Tomoko is the ultimate perverted, selfish jerk who blames all her problems on others, especially other women. She's a liar who wants desperately to be someone she's not without taking any steps toward being that person. Thankfully, slowly throughout the series she takes steps to be less of a jerk and more of who she truly wants to be. This show really isn't supposed to be a self-congratulatory otaku joke fest that shows all your life views were right; all the jokes are at Tomoko's expense and she's absolutely seen as a rude loser. 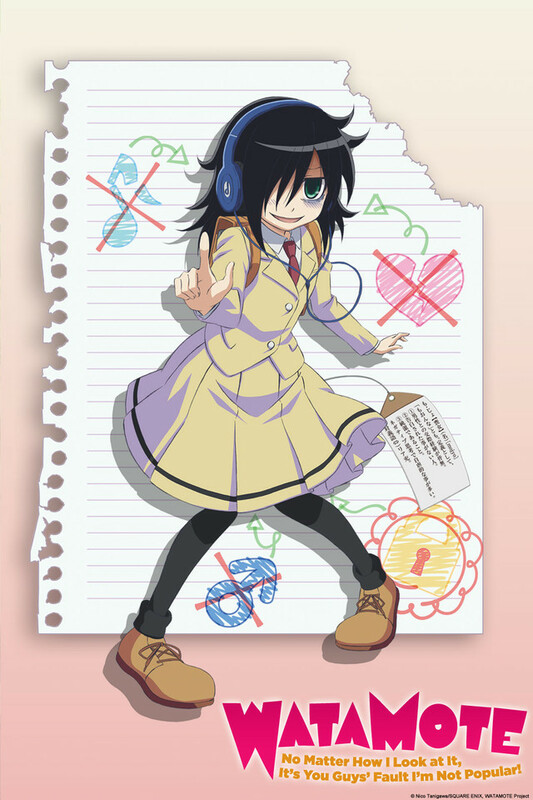 All that being said, this show is funny and sad, in kind and I hope Tomoko gets a second season to grow even more. Watamote is an amazing cringe fest. I've never cringed so hard, yet laughed so much at an anime. Tomoko is awesome, and is stuck in her own little world. The awkward situations mixed with her failure to socialize in public leads to one of the best comedy animes ever. I know some won't be able to stand the cringe humor, but if you like this sort of humor, then you will love Tomoko in Watamote. Watamote is about a girl named Tomoko Kuroki who is in her first year of high school and an extreme loaner who dreams of being popular. In terms of the overlying plot, there is not much, it just follows her throughout her first year of high school as she tries different ways to become popular. What makes the show so good is the adult humor and the portrayal of people who are loaners. Unlike many other shows it does not outcast the character, instead it makes her the protagonist. I feel that this anime needs a second season for a better plot-line and story. Other than that, it was a great filler for a small hole in my life. I really like Tomoko. I just wish she had some kind of boyfriend in the end, or girlfriend. It's kinda like she was robbed of having a nice time, y'know?